Bramble voice infrastructure goes global. At risk of reeling out cliches: online tutoring really does put the world at your fingertips. Weâ€™ve been pleasantly surprised by just how widespread the use of online tutoring through Bramble has been. Weâ€™ve seen sessions take place all over Europe and North America but also in China, India, Singapore, Chile, UAE, Russia, Nigeria and Brazil, to name just a handful. In all, Bramble has now been used in over 56 countries. When the internet gives us such international reach, we often forget about the underlying physical processes that are actually taking place. In our case, one of those key processes is voice latency. Voice quality is largely dictated by how long it takes for what Iâ€™m saying to reach you on the other end of the line. This delay is the voice latency. Latency greater than 200ms leads to a noticeable degradation of call quality. If your latency is less than 200ms, then your conversation will feel like youâ€™re sat in the same room. Above 500ms, itâ€™s like shouting across a stadium. If youâ€™re up towards 1 second, thatâ€™s like trying to hold a conversation via megaphones from either end of a runway - itâ€™s probably not going to be that smooth. So, what affects latency? Your local connection speed to the internet and then the physical distance your voice has to travel along the internet backbone. 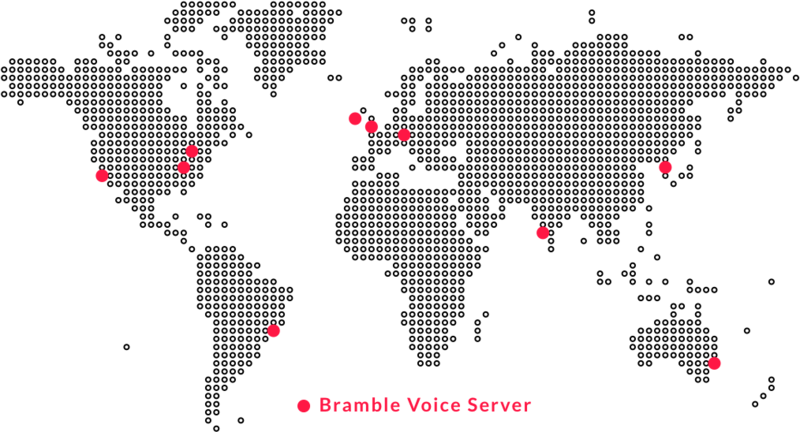 In the past, Bramble had a single voice server in Dublin. That meant that all conversations had to travel via Dublin. Thatâ€™s fine if you were in Europe, less good if you were in the US or Australia. If two users in California were having a Bramble session, their voice would be travelling a 16,000km round trip. If they were both in Melbourne, then theyâ€™d be looking at a 35,000km round trip. This didnâ€™t preclude a good voice experience but it did mean that you needed to have a very good local connection to compensate. Thatâ€™s all changed now. Given that local connection speed is a largely fixed variable, we decided to invest in minimising the distance our users voice has to travel. We've been busy deploying voice relay servers all across the globe: in London, Dublin, Frankfurt, Montreal, Virginia, Mumbai, California, Sao Paulo, Seoul and Sydney. Our Californian and Australian friends from earlier now see their voice travel less than 1000km between each user. You can now be confident that wherever in the world you are using Bramble, your voice will always be routed via the lowest latency route for the best voice experience possible.